In July, the American Psychiatric Nurses Association (APNA) announced the 2018 class of APNA Board of Directors Student Scholars. 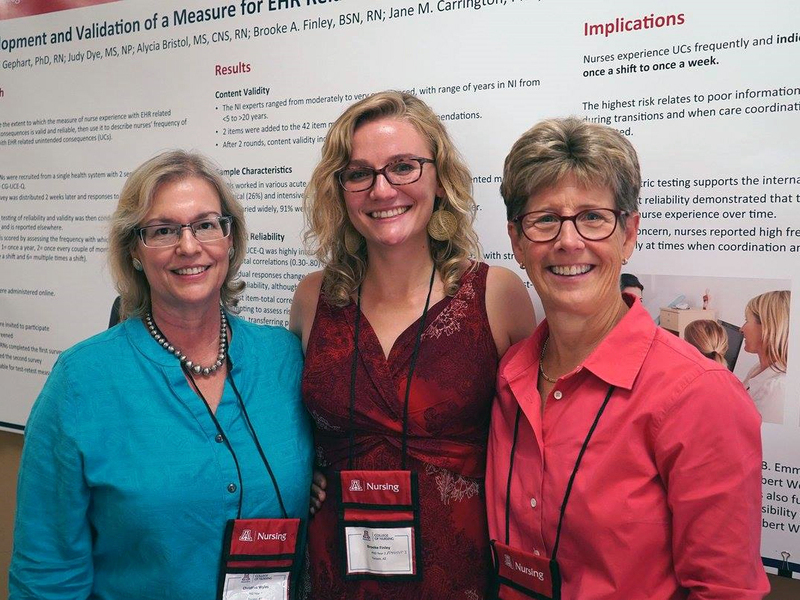 Fourth-year University of Arizona College of Nursing dual DNP (PMHNP)/PhD student Brooke Finley was among 15 graduate students from across the country that were selected for the honor. She and her fellow scholars receive an all-expenses-paid trip to the APNA 32nd Annual Conference in Columbus, Ohio in October, as well as a one-year complimentary membership in APNA. The intent of the scholarship is to enable the honorees to connect to psychiatric-mental health nurses at all levels and develop their professional skills. “Brooke is one of those students that as a chair, you can guide but the most valuable thing to do is to stay out of her way and watch her bloom.” said Kimberly Shea, PhD, RN, CHPN, UA College of Nursing professor. What kind of skill development will this scholarship enable? It’s a huge networking opportunity. You get to meet with all of the key players who are involved in APNA, including the board of directors and the president, and additionally you have a chance to network and do some coaching with other students. I’ve been on the Leadership Board of the Arizona APNA for the past year-and-a-half, and I’ve gone to many of the trainings that they’ve offered. I’m also a journal reviewer for the APNA Journal, so it’s a really great recognition of the efforts that I’ve put into the APNA, both nationally and with our local Arizona chapter. The BOD scholarship will allow me to connect on a national level to help support the local chapter. Also, as a student, this will really help me with networking and taking the board certification exam after I graduate. Why did you decide to pursue a career in nursing? I volunteered in a hospital for two years during high school. I got more responsibilities as time went on and I ended up being a nurse’s assistant on a medical-surgical floor. At the time, I actually wanted to be an English teacher but I loved how in nursing you could hear about people’s lives and their stories - their progress as human beings - and I realized that in nursing you can do that but you actually get to see the rewards immediately through your actions helping someone during a difficult period of their life. What drew you to pursue a psych-mental health specialty? It wasn’t until I did clinicals that I realized I wanted to do psych, which was by far the most interesting rotation to me. Before that, I didn’t have a great understanding of what mental illness was, although many of the people that I loved or cared about suffered from it. I always just saw them as human beings first, so it was easy for me to connect with patients, and really want to help them, and not be judgmental. Once I had that experience and realized I had a knack for it, it was such an easy fit. When I’ve been practicing as a psychiatric nurse, there hasn’t been one day when I haven’t wanted to go into work. Every day is different, every day is interesting. I love what Ido and I wouldn't want to do anything else. What features of your program really made you passionate about your studies? I got into the program doing research and I had the best mentors to help me with graduate school getting started. Like Dr. Jane Carrington, Dr. Sheila Gephart, Dr. Kimberly Shea, Dr. Barbara Brewer, and Dr. Kate Sheppard were all of my mentors through the graduate journey, and I just wanted to stay because I just felt so supported and respected as a person here.